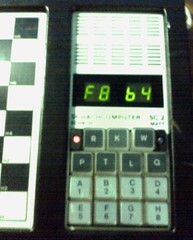 mclane wrote: most often when they say nothing, the east german dedicated chess computers only have an old glass-melting fuse rotten. do you know where i can order these fuses? and do you know the voltage? IMO these fuses you can get in almost any electronic shop. only problem is to find out about the ampere number. replace the fuses for you without damaging the computer. numbers of the fuses. if you don't have such a plan, there should be those plans somewhere in the internet. i wish you good luck. my machine also lost the sound feature. i also think it is the fuse. as far as i can see there are 2 fuses. on for the main power AC/DC, and a second one close to the loudspeaker. maybe the one at the loudspeaker is off. the wire in the little glass-tube is very thin and one cannot really see very good if it is still working. so i will also try to get my second SC2 repaired somehow. still we have no confirmation IF and WHICH version of fidelity was cloned. mclane wrote: i wish you good luck. my machine also lost the sound feature. i also think it is the fuse. as far as i can see there are 2 fuses. on for the main power AC/DC, and a second one close to the loudspeaker. Thanks again for your advice and for your good luck wishes because it worked! the SC2 works and with full sound! 1. d4 d5 2. c4 c6 3. Nf3 dxc4 4. e4 Qa5+ 5. Bd2 Qa6 6.
i am very happy to see that your machine is alive again. fern wrote: I wonder if ever, at least in this field, socialists countries produced an original piece of hardware. Even the eastern humans are cracked westmen !